That it's the best bloom in years adds to my delight. Every branch is covered with fragrant spidery crepe paper flowers that never fail to charm as they furl on cold days and unfurl on warm ones! 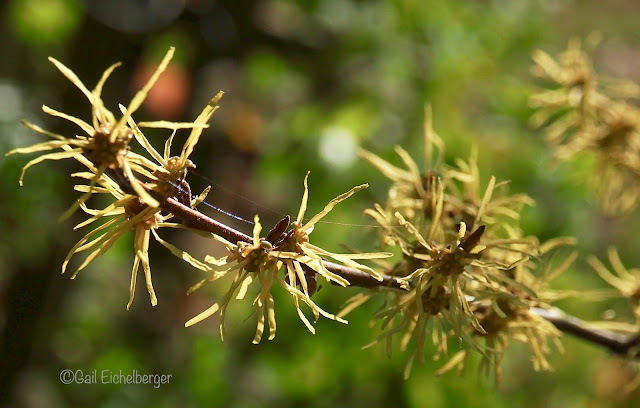 It's a darn shame that it is overlooked by most nurseries in favor of the flashier non-native witch-hazels. Just step away from those Chinese witch-hazels and ask for Hamamelis virginiana! You won't be disappointed and that's a promise. H virginiana is a great all around small tree/shrub for most gardens and those of you who garden for wildlife might consider planting it for the good wildlife value it adds to a shady garden. In case you are still thinking non-native! It's upright spreading branches are good nesting sites for birds. The dispersed seeds are eaten by birds and small rodents. Now don't turn your nose up at the mere mention of rodents, yes, they are pests, but, they are also extremely important critters for hungry owls and hawks. Lovely fragrant, bright yellow flowers that bloom from October through November. It's native to eastern North American, including Louisiana and Texas. 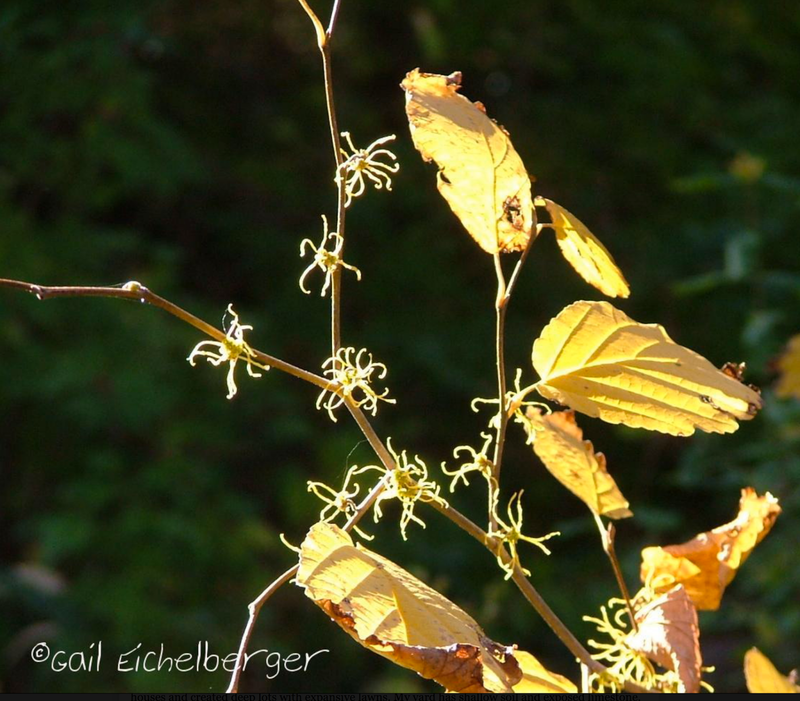 You mention witch hazel is a tough character that can handle a variety of garden situations. I think of it has needing partial shade (and you mention it's often found in woodlands). Do you have any growing (and doing well) in full sun settings? No, I don't. It's an understory tree in my gardon. I've been meaning to plant one of these for years. I wonder if deer will chomp on it? Never have seen an deer damage and they are in my garden. 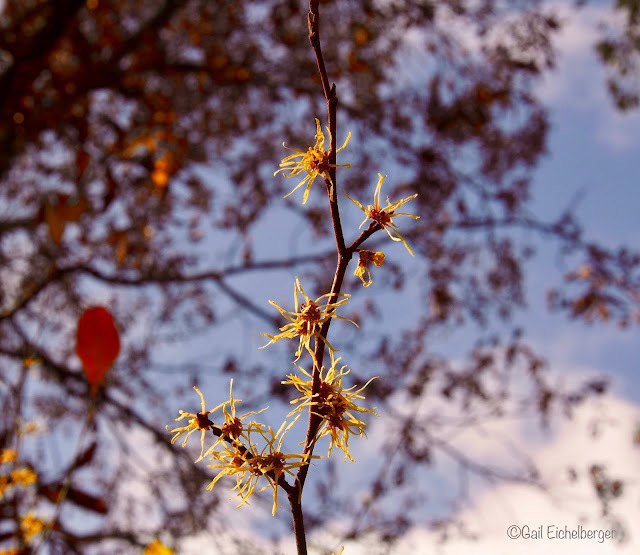 I love witch hazels. Yours has so many more blooms than mine does. Doesn't matter I still love it. This is the best year ever...Might be its age! Hi Gail, I am putting in a rain garden to catch runoff from my house and driveway. I’ve found a lot of recommendations for sunny rain gardens, but this one is mostly in the shade, with some morning sun. Do you think this might work in the lower part? Yes, but, not under water! Our wetlands are covered in witch hazel. Ours are finished blooming for the year...love them! That's so cool. I hope to see them some day! I am going to order one this fall. 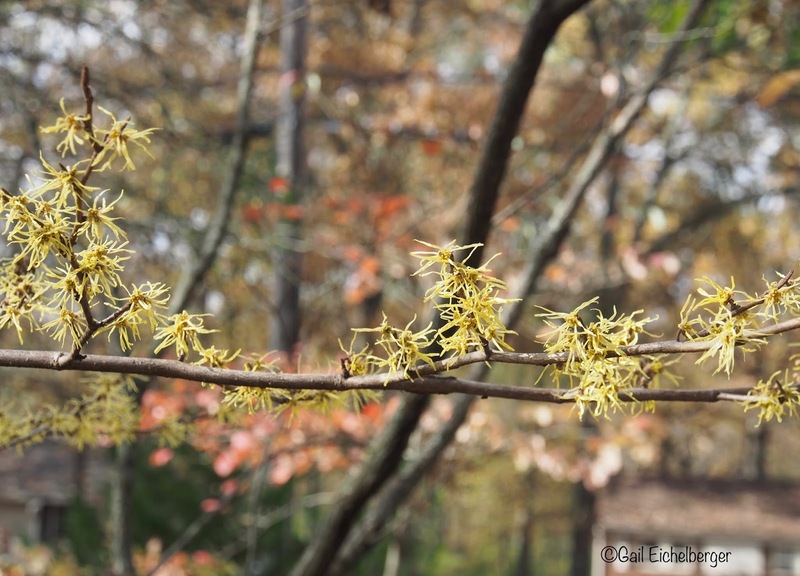 I have wanted some native witch hazels for years and I don't know why I keep putting it off. It sounds like it would love it here. I love this shrub and, like you, particularly enjoy the colour it brings to my garden at this time of year. So often the skies are grey now, but the witch hazel always brightens my day. I notice a question from Alan about deer. I have LOTS of those but they have never touched my hamamelis virginiana. It's the only thing happening in my garden in November. Love it. I do have H. virginiana. I've had it for several years, but it never blooms.